Rabbi’s Home Going High-Tech for Shabbos Every Friday evening as New Yorkers wrap up another work week, tiny pockets of town are abuzz with last-minute preparations. The city’s Orthodox Jews are getting ready to go dark. Roughly 500,000 Jewish people around New York prepare for sundown with a flurry of activity: there are light timers to be set, hot plates to turn on, and oh, one more thing: don’t forget to unscrew the light bulb in the refrigerator. Because once the sun begins to set on Friday, nothing can be turned off or on, no work can be done here for a full day, until the first stars appear in the Saturday night sky. That means even something as everyday as flipping a light switch is temporarily off-limits. This is Shabbos, one full day of rest, and it’s not just for people, it’s for their electronics, too. But a few Orthodox Jewish homes, tucked away in an inner pocket of Brooklyn, are starting to make their own Friday evening routines surprisingly high-tech. 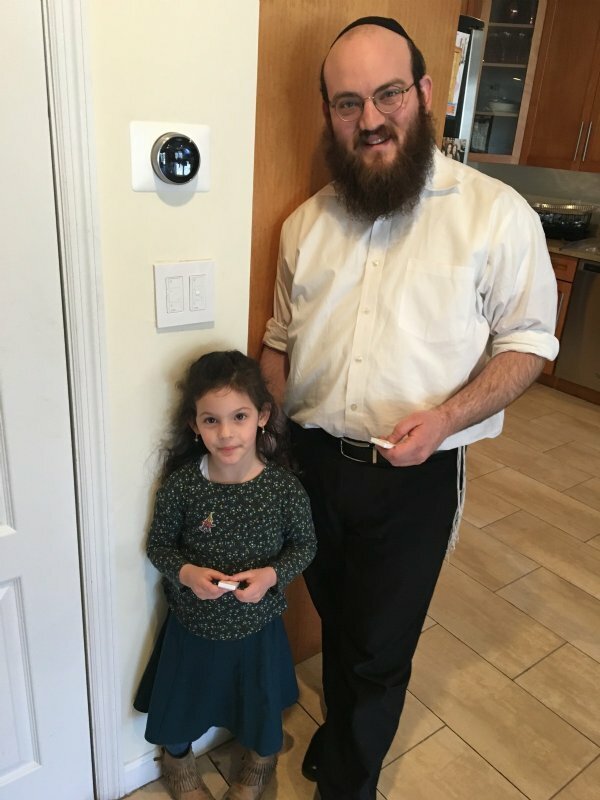 Because their Shabbos is going “smart,” as the Orthodox parishioners install connected homes: pre-programmable smart lights, smart outlets and smart thermostats. Rabbi Shmary Gurary is leading the charge. Gurary, a short man with a characteristically thick Orthodox beard, lives with his wife and three little girls. Gurary says his family often celebrates their Shabbos with guests who join his family around their long, wooden table for a meal. Having smart tech installed means now there’s just a little less for them to do around the house on Friday afternoons. In the shuffle to prepare meals and light candles, with one click in a smartphone app, he’s got their Shabbos lights queued up and the thermostat set. On his “Shabbos setting,” the lights above his dinner table go bright for evening meals, while the bathroom stays lit all night long, helping his kids find their way to the toilet at night. And Shabbos lighting isn’t just convenient, it has the power to make the weekly holiday just a little safer, too. Smart wall outlets can automatically turn food warming plates on and off, potentially avoiding deadly fires like the one that killed seven children last year in Brooklyn after a hot plate went ablaze. For years, smart home technology has been a luxury for the very rich in New York. Mark Hernandez knows a little something about those kinds of niche smart home installations: he’s the founder of New York smart home company Cliqk. And he’s been installing a brand of what he calls “super custom bespoke systems” for 12 years. Cliqk put lasers in the floors at the Beats headphone store in Soho and built a smart sound system that adapts to crowds for French fashion house Zadig & Voltaire. But after more than a decade of outfitting fancy digs, Hernandez wants his smart systems to go mainstream. He’s confident that if consumers see the tech in action, they’ll love it. But how will he get people to try it out in their own spaces? Hernandez considered a few other niche test markets, including the Lower Manhattan mom group HRP Mamas as well as Airbnb (smart keys, anyone?). But Hernandez thinks the city’s Orthodox Jews may have an even more compelling need for his Smart Shabbos. And as it turns out, they also have what could be the secret low-tech ingredient the smart systems need to really take off: chatter. The good old fashioned word of mouth that’s fostered in a close-knit religious community. “Everyone knows each other. Everyone talks to each other,” Hernandez says. As more and more in Gurary’s community see what a smart home looks like, Hernandez’s tech seems to be catching on: in his first 30 days in Brooklyn, he had 30 smart home referrals. If those can translate to installations, it would mean some good business for Cliqk. “There’s no reason why we shouldn’t use new technology,” Gurary says of the new tech. While the system may be Rabbi-blessed, Gurary knows it could take some time for the system to catch on more broadly with other Orthodox Jews. He describes his branch of Judaism, Chabad, as a sect of people who see themselves as “pillars of light in the world.” With any luck for Hernandez, they’ll soon shine pillars of light on the virtues of the connected home too, for all the non-believers still in the dark.